Yulee, FL – Springer Controls, in partnership with Texelco of Italy has introduced a new line of explosion proof signal lights certified to ATEX specifications for installation in zones 1, 2, 21 and 22. Multicolor lights are available in both domes and stack light styles. All can be set to provide a steady on signal or a flashing signal depending on your preference. Multicolor lights can flash alternately between colors when multiple signaling conditions are present. Single color lights are available for 24V AC/DC input as well as 115VAC or 230VAC. Multi-color lights are available for 24V AC/DC input power. The new explosion proof dome lights are available in single color lights in red, orange, yellow, green, blue and neutral colors. Additionally, bi-color dome lights are available in either orange/red, and red/green color combinations. 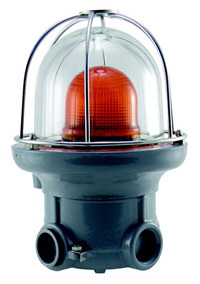 Additionally, our popular 370 series lights are now also available in explosion proof design. The 370 is available in single color, tri-color and quad-color. This allows a single light to communicate multiple messages safely in a hazardous environment.